Session players are the unsung stars of the music industry. As temporary members of big name bands, they step in during recording or touring to fill in the gaps in an act’s lineup, and often learn their parts in only a matter of hours. While front men and bandleaders might get the bulk of the money and the fame, it’s the session musician who is often responsible for playing the bass line or guitar riff that helps makes a song a hit. Some of them—like Led Zeppelin’s Jimmy Page and John Paul Jones—have even gone on to become rock legends. Here are the top ten session musicians and studio groups. You might not have heard their names, but you’ve definitely heard their music. Austrian percussionist Thomas Lang isn’t as famous as Neil Pert or Keith Moon, but he’s regularly listed by music magazines as one of the most technically skilled drummers in the world. Lang began drumming at the age of five, and gained prominence in the 90s after a string of session gigs and tours with pop acts ranging from Peter Gabriel to Kelly Clarkson. In addition to his career as a studio musician, Lang also plays as a solo act and as part of the avant garde heavy metal band stOrk. Famous for his high speed drumming and mesmerizing stick spinning, Lang is also known for a series of instructional books and DVDs called Creative Control, and for the Thomas Lang Drumming Boot Camp, an intensive 8-day camp that specializes in instructing serious players on advanced drumming techniques. Little known outside of Los Angeles, the Hollywood Studio Symphony is a rotating group of orchestra musicians responsible for playing the soundtrack music for countless big screen films. While most of its members are classically trained, the group does not perform outside of the studio, and it doesn’t even have a stable lineup. Instead, it is a revolving door of contracted session players from around the L.A. area. The group first got its name in 2002, when the American Federation of Musicians negotiated with the studios to have film music performed by local musicians, but the symphony has been around in some form or another for many years. Among hundreds of others, they are responsible for the soundtracks to films like Back to the Future, Blazing Saddles, L.A. Confidential, Star Trek, and The Bourne Identity. One of the most famous session bands of all time, the Muscle Shoals Rhythm Section is a group of Alabama-based musicians who have backed up some of the most storied acts of the 60s and 70s. Also known as “The Swampers,” The Rhythm Section were responsible for creating the famed “Muscle Shoals Sound,” which can be heard on numerous songs including soul hits like The Staple Singers’ “I’ll Take You There” and rock classics like The Rolling Stones’ “Wild Horses.” During a time when racial tensions were constantly at a boil in the Deep South, the Muscle Shoals Rhythm Section, whose members were all white, were responsible for recording with a number of black Motown acts at their Muscle Shoals Sound Studio. Even at the age of 71, journeyman guitarist James Burton is still going strong as a session musician. Born in Dubberly, Louisiana, Burton was a semi-pro musician by his early teens, and by 18 he had already played the guitar solo on the 1957 Dale Dawkins hit “Susie Q.” Since then, Burton and his trademark Fender Telecaster have appeared on dozens of recordings, including albums and live shows by Johnny Cash and Emmylou Harris. Burton was one of the members of The Wrecking Crew, a loosely organized group of L.A.-based studio musicians, but he also toured constantly with the likes of Jerry Lee Lewis, Elvis Costello, and Bob Denver. Still, his most famous gig is arguably his eight-year stint as the lead guitarist in Elvis Presley’s TCB band, with whom he played over a thousand shows. Burton remains one of the most respected guitarists in the music industry. When he was inducted into the Rock and Roll Hall of Fame in 2001, he was introduced by none other than Rolling Stones guitarist Keith Richards. Piano player Billy Preston is a familiar name to music fans. He had a lengthy solo career, several hit songs including the classic “Nothing From Nothing,” and even won a Grammy for his 1972 instrumental track “Outa-Space.” But while Preston’s own output was impressive, he is still best known to many for his studio collaborations with icons of 60s and 70s rock and roll. A music prodigy, Preston started playing piano at age three, and by age 16 he had already featured with Little Richard, Ray Charles, and Sam Cooke. Preston first met The Beatles in 1962 while on tour with Little Richard, and in 1969 he reunited with the Fab Four to play keyboards on the group’s final album, Let It Be. Preston’s influence on the record was so pronounced that John Lennon briefly considered making him a permanent fixture in the band, and Preston has since become one of the many musicians referred to as the “fifth Beatle.” Billy Preston would go on to record and tour with bands like The Rolling Stones and Eric Clapton. Before his death in 2006, he also featured on albums by Johnny Cash, Steve Winwood, and The Red Hot Chili Peppers. Described by many as the most widely heard bass player in history, Carol Kaye has played on dozens of Billboard Hot 100 hits while still remaining unknown to most casual music fans. The daughter of two musicians, Kaye grew up in Los Angeles, where she worked as a bass instructor in her early teens. After playing in a variety of live acts, Kaye fell into studio work in the 1960s when a scheduled session musician neglected to show up to a recording gig. Kaye stepped in, and soon became the recording industry’s go-to bass player. English percussionist Ray Cooper has played drums for some of rock’s biggest names, and along the way he’s developed a cult following for his unique choice of instruments, astounding technical skill, and prodigious, often 15-minute-long drum solos. Cooper is probably best known for his association with Eric Clapton and Elton John, but he’s also toured or recorded with everyone from Wings to Weezer. Not content with your everyday drum kit, Cooper has been known to use a massive percussion set-up that also includes glockenspiel, tubular bells, congas, tambourine, and even a gong. 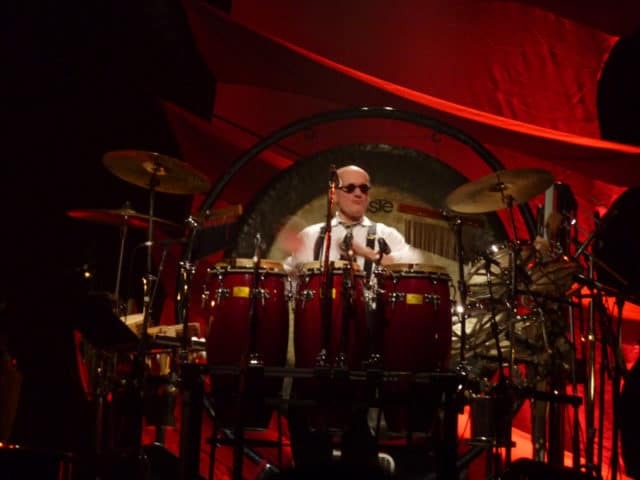 His on-stage enthusiasm made him a fan favorite during a mid-90s tour with Elton John, when Cooper and his mountain of percussion instruments served as the only back up to the singer-songwriter and his piano. In addition to his music career, Cooper also moonlights as an actor, and has appeared in small roles in films by Terry Gilliam and Robert Altman. Individual members of The Wrecking Crew appear elsewhere on this list, but it would be an oversight not to recognize the whole group for their immense contribution to pop music. The Wrecking Crew is perhaps the most well traveled gang of studio musicians in recording history. If you’ve ever listened to a hit song from the sixties or seventies, then you’ve likely heard The Wrecking Crew playing in the background. The Crew was composed of a group of L.A.-based studio players, many of them classically trained, who became the number one call whenever the record companies needed a back-up band. Their most notable collaboration was with producer Phil Spector, who used the group’s great breadth of talent to create his famous “Wall of Sound” on songs like The Ronettes’ “Be My Baby.” But The Wrecking Crew didn’t just play rock songs. They also played on commercial jingles, TV show theme songs, and film soundtracks, among them M.A.S.H., Bonanza, and Mission: Impossible. Some members, like Tommy Tedesco and Carol Kaye, remained studio musicians for most of their careers. Others, like guitarist Glen Campbell, went on to be famous solo acts. The Funk Brothers featured a core team of 13 musicians, and were known to experiment with unconventional and often jerry-rigged instruments. On some songs, they even used tire irons and snow chains as percussion equipment. In 1972, The Funk Brothers were unceremoniously dismissed from Motown after the label moved to Los Angeles. Most of the members continued to operate in relative obscurity as master session musicians, but it was only recently that their important contribution to pop music was finally recognized. Drummer Hal Blaine is the epitome of what it means to be a session musician: talented, prolific, and yet still relatively anonymous. While his name is certainly well known to music diehards and industry insiders, Blaine has never been a mainstream star. Despite this, he has featured on thousands of songs, and is often listed as one of the most recorded musicians in history. Not only that, but he’s played on more number one hit songs than any living musician, and more than Michael Jackson and The Beatles combined. These include such classics as “Mr. Tambourine Man,” “Strangers in the Night,” “Good Vibrations,” and “Mrs. Robinson.” As a member and unofficial ringleader of The Wrecking Crew—whose name he coined himself—Blaine was also responsible for creating the themes to famous television shows like M.A.S.H. and The Munsters. A popular anecdote about Blaine tells of how the drummer would carry around a rubber stamp that read “Hal Blaine Strikes Again!” so that he could leave his mark on every sheet of music he used or club in which he played. According to some accounts, by a certain point in the 70s, there were few music venues that didn’t have Blaine’s stamp on them. He was simply that much of a presence in the music industry—and remains so to this day. Drummer Earl Palmer should be on this list. You must be young. You may want to revise this as so many are left off, #1 Steve Cropper, not only a session guitarist but wrote a little tune called Sittin on the Dock of the Bay, was a member of Booker T and the MG’s. Yes, Waddy, Russ,Danny, Craig and Leland were on hundreds of hits.